Grab a 'Cup of Joe' on Cowboys gameday mornings to get Joe's insights on the upcoming matchup and his prediction on the game. ARLINGTON – Grab a ‘Cup of Joe’ on Cowboys gameday mornings to get Joe’s insights on the upcoming matchup and his prediction on the game. The first Zeke Elliott versus Saquon Barkley showdown in the pro ranks headlines this divisional matchup, but it’s not the first time they’ve faced off. Back in 2015, Elliott’s Buckeyes beat Barkley and Penn St. Barkley was more productive, out-gaining Elliott 194 to 153 in rushing yards, with Elliott scoring the only rushing touchdown between the two. 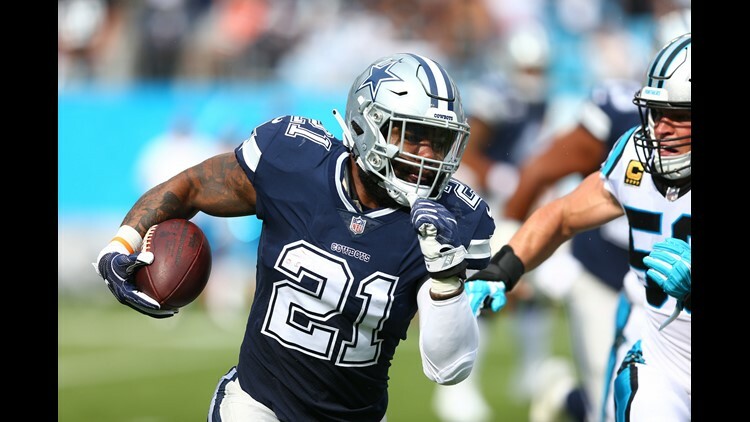 Elliott got off to a slow start with 69 yards on 15 carries against the Panthers. But this will be a much different test. The Giants front seven is nowhere near as good as the Panthers’. Luke Kuechly was a menace to the Cowboys ground attack, especially early in that game. If the Cowboys can attack the edges and stay away from Giants defensive tackle Damon “Snacks” Harrison, Elliott should find room to operate. Expect Elliott to crack the century mark in rushing yards for the first time this season. And I look for him to get at least 25 combined touches after just 18 in Charlotte. As far as trying to slow down Barkley, good luck. The rookie first-round draft choice showed his speed and power on a 68-yard touchdown run in the Giants opener. Sean Lee can’t wait to get on the field to make up for a subpar performance in week one. He misses more tackles than I can remember, as he knocked off the rust after not seeing much time in the preseason. Lee will be better, and the Cowboys front seven better be against the talented rookie. Cowboys quarterback Dak Prescott used those two words to answer Giants safety Landon Collins. Collins said they’d try to put the ball in Dak’s hands, thereby giving the Giants a better chance to win. It’s not earth-shattering, it’s the norm. But Collins was direct and it came off as calling out the Cowboys third-year quarterback. Now Prescott has a chance to return fire on the field, but he must have help. I’ve seen this stat a lot this week: Prescott has failed to throw for 200 yards in seven of his last nine games. On the surface, it sounds awful, but dig just a little deeper. Elliott didn’t play in six of those. And get this - in Prescott’s first 22 starts, he was sacked 32 times, in his last 11 starts, he’s been sacked 31 times, including six against the Panthers. The pressure has been inordinate when the Cowboys can’t get the running game going. That has to change to give Prescott a shot. Dak took responsibility for week one’s awful performance. 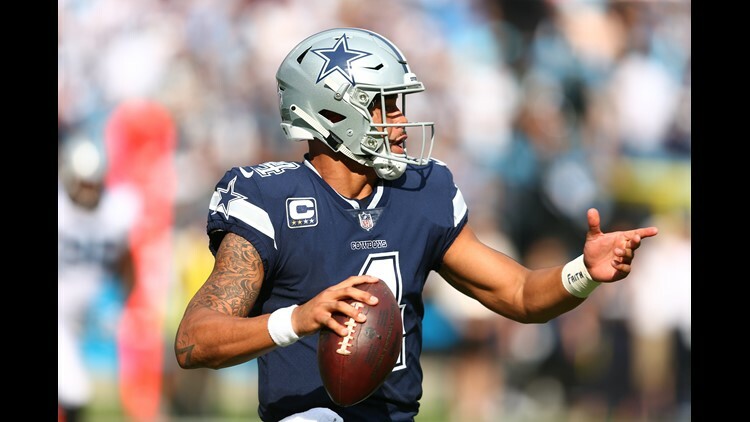 The Cowboys converted just 2-of-11 first downs with Prescott completing 19-of-29 passes for 170 yards and no touchdowns. He missed throws because I think the pressure affected his footwork. He missed a wide-open Blake Jarwin while Prescott was on the move getting pressured. I’d like to see what Dak will do with a clean pocket. And now he has had a chance to review one game of tape with his revamped receiving corps. Look for significant improvement. Prescott has put in the work and this week, and it should yield dividends. The Giants weren’t the only ones throwing shade in the run-up to this one. Cowboys defensive end DeMarcus “Tank” Lawrence said he “dreams” of nights like this, on the national stage, knowing Giants Quarterback Eli Manning will be sitting in the pocket. Lawrence took a shot when he described what could happen with good coverage on the back end. "He's already in the pocket so he's not going to be able to throw it out so he's got to take the sack,” said Lawrence. "I mean, sometimes, it's smart football and sometimes, you know, I feel like it's fear. Take it how you want." Using the “F” word, fear, to describe Manning’s demeanor will rattle some Giants cages, and make for another juicy storyline Sunday night. Lawrence will square off against Giants right tackle Ereck Flowers. There will be opportunities to make game-changing plays, and everything we’ve seen from Lawrence so far this season leads me to believe he is capable of making that type of play. Manning is good for about an interception per game against the Cowboys. He’s thrown 28 in 27 games in his career. Cowboys defenders have to make that catch when the opportunity comes their way. Cowboys offense will be good for fewer mistakes more production, especially on third down. The defense will pressure Eli Manning into enough mistakes to make up for the big plays Saquon Barkley and Odell Beckham, Jr. figure to make. Give me Cowboys over the Giants 24-20.